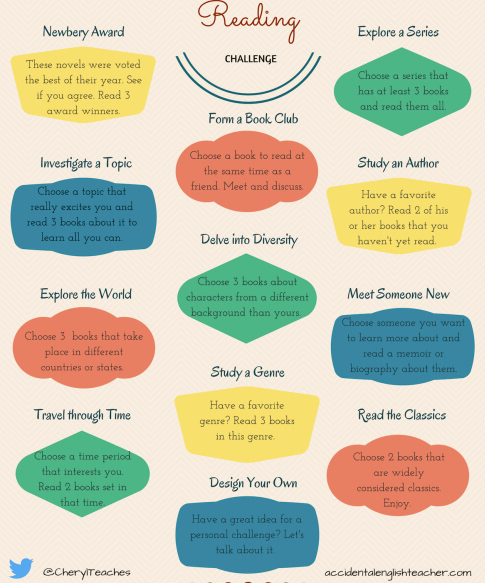 This year, you are being challenged to read at least THIRTY books! You may think that's a lot. A TON. AN ENORMOUS AMOUNT! But, in reality, it's not. It's very feasible. And you CAN do it. 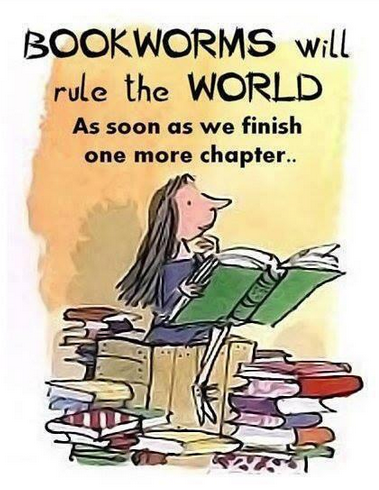 One book at a time. Twenty minutes a day. You develop a routine, and it all adds up! A good book...can change us. ...reading stories can actually improve your social skills by helping you better understand other human beings. The process of entering imagined worlds of fiction builds empathy and improves your ability to take another person's point of view. It can even change your personality. ...as we read fiction, we...also learn more about ourselves, others, and how we might relate to one another. Reading great literature...enlarges and improves us as human beings. 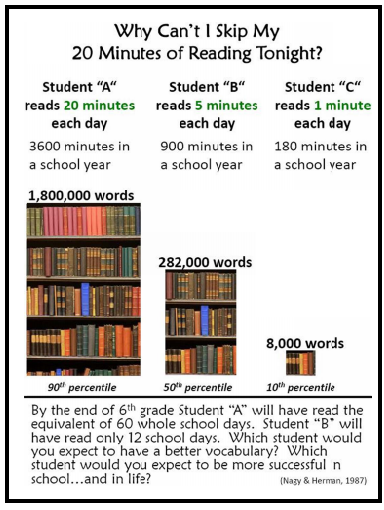 Having a difficult time actually READING during independent reading time? Ask a teacher or parent to observe you for just ten minutes, over a three-day period, using this document. Make your observations, have a discussion, and decide on a plan to help you succeed. This idea is from Reading in the Wild by Donalyn Miller with Susan Kelley, 2014. How can my Instagram account help me read more books? Well, check out what books are being read on the #bookstagram and #bibliophile hashtags! Want to make your own posts more alluring? Check out this intriguing post from Book Riot! You're finding it difficult to connect to your reading friends today? Add your thoughts to this Padlet - What We're Reading On our Snow Day! ​Here are the books that students in 28 countries read... Are you up for the challenge? The Open Library - online reading! But what should I read next?? Book Me - Personalized reading suggestions from AHML! Destiny Discover - put in the last good book you read, and click "explore"
​ this form (from a HS student). Check your email regularly for a response! Go Book Yourself - a Tumblr account that is updated often w/new recs. The Ultimate Guide of Books for Reluctant Readers aged 12-13! Best Books for Ages 9-14 ! Best Ever Teen Books - 100 ! Love Reading Map - Find books based on their locations! Novelist - from your AHML library! When you find more sites that deserve to be on this list, let me know! How do you spot a FAKE news story? ​ Here is a checklist (not perfect!) to help you. Some parents are too generous, and may consider giving your teacher or your ELA class a gift. If this is the case, please rethink food, and instead consider Amazon or Barnes & Noble - you will be giving more current books to our classroom library! THANK YOU! You are already a WILD reader? How do you keep reading engaging and fresh? By setting a challenge for yourself! Here are a few challenges - see which one will suit you this year, or come up with a new one for yourself to share with us. Thank you to Mrs. Mizerny (@CherylTeaches) for the ideas! The Nerdbery Challenge - Read the Newbery Award winning books. Book-A-Day Challenge - Read a book every day (can be picture books, blog posts, articles, etc...). Book Gap Challenge - What are your book gaps? What don't you read, and why? Figure out your gap, and set a challenge for yourself to fill that gap. Geography Challenge - Choose novels that take place in different countries or states in the U.S. Read novels from at least four different geographic locations. Immigration Challenge - Read these eleven books. ​Make a Book Club Challenge - Create a book club, choose a time, choose a book, and read with a club! Share your thoughts, then choose another book. Read Harder Challenge - Don't just read, read harder! Series Challenge - Find a series of three or more books and read every book in the series. Design Your OWN Challenge! - There are many other challenges out there. On the Internet, there are challenges such as The Rory Gilmore Challenge, the recommended "Must Read in Middle School" lists, The Mighty Girl Website recommended list, Read-Alike lists (the types that are "If you loved ___, then try ___), and many more. If 30 books feels overwhelming, you may simply determine the number of books that you feel you could realistically read in a month/year and make that your challenge.